After taking a few pictures in Rebsamen Park earlier on Saturday, I had some time to kill before that night's FC Dallas soccer game. 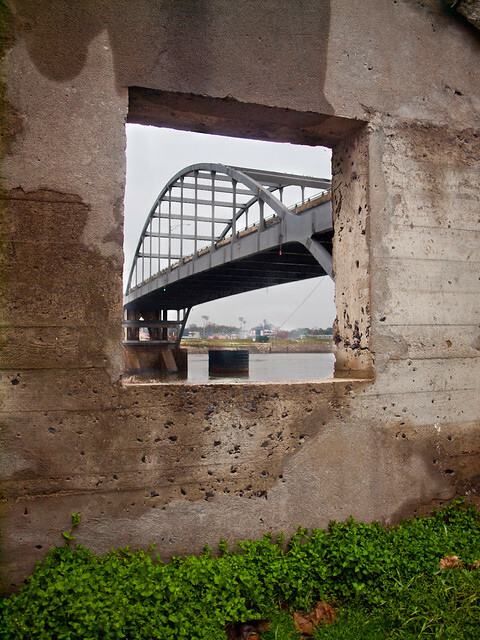 So I decided to wander around downtown Little Rock to try to get a few pictures. There had been a few ideas for shots that have rattled around in my head for awhile now, but I've been too busy (or lazy) to get. Last weekend was a perfect time for attempting some waterfall photography. The conditions were perfect - cool, cloudy and slightly raining. But alas, I was feeling lazy. I wanted to take pictures of something, but didn't feel like making a long drive up into the Ozarks. But lo and behold, there is a waterfall right here in Little Rock that I've read about before, and have long wanted to visit. 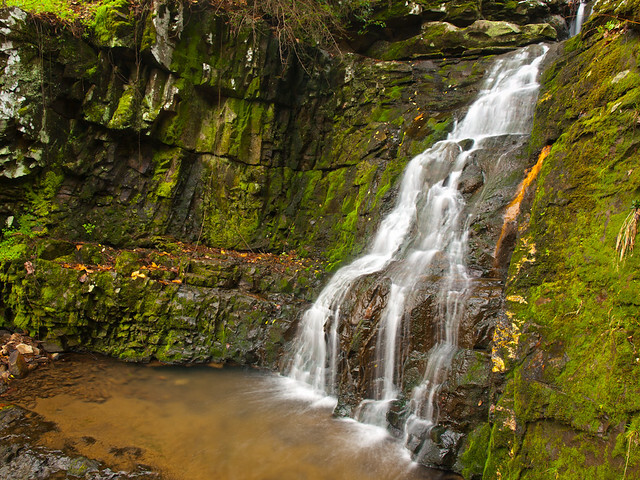 The waterfall is located along a gulley in Rebsamen Park, and it looked promising from the pictures I had seen. So I headed to Rebsamen Park, and began the short hike to the falls. 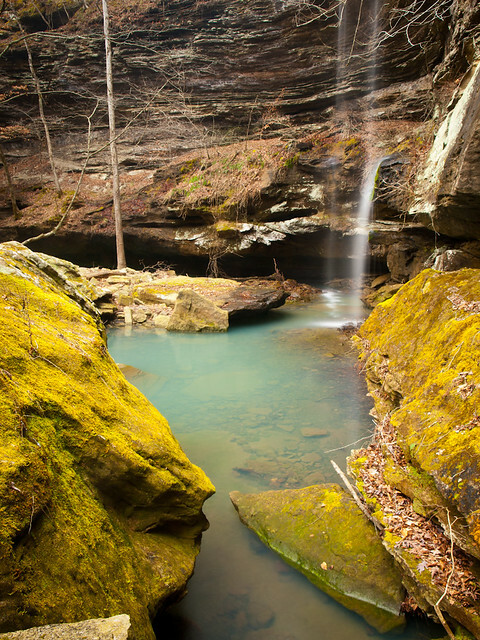 I had hoped that since the falls are in a more "urban" area, they would be easier to reach than the typical Ozarks waterfall. 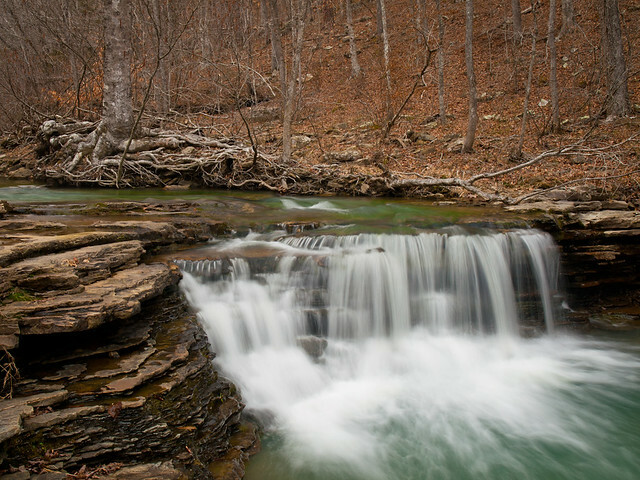 I naively assumed that the falls could be reached by a short and level hike, without any of the pesky fallen trees that have marked the forests of the Ozarks after the 2009 ice storm. That wasn't the case. 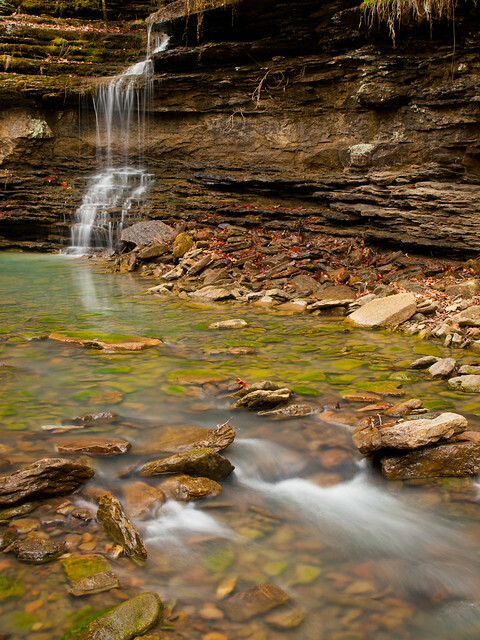 You could immediately tell that being in the middle of the state's largest city meant that the hike would be a bit different than one out in the middle of the Ozark wilderness. 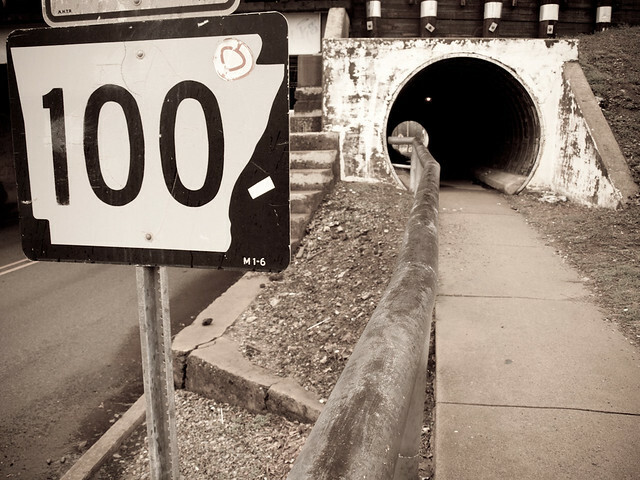 To get to the gulley with the waterfall, you leave Rebsamen Park Road and follow a sewer pipe to some railroad tracks. From the tracks you just follow the creek a short distance to the falls. Which is much easier said than done. The gulley around the falls is steep, and was slippery in the wet weather. And the gulley was littered with fallen trees, which are probably the result of the Christmas Day blizzard last year. The falls are interesting. 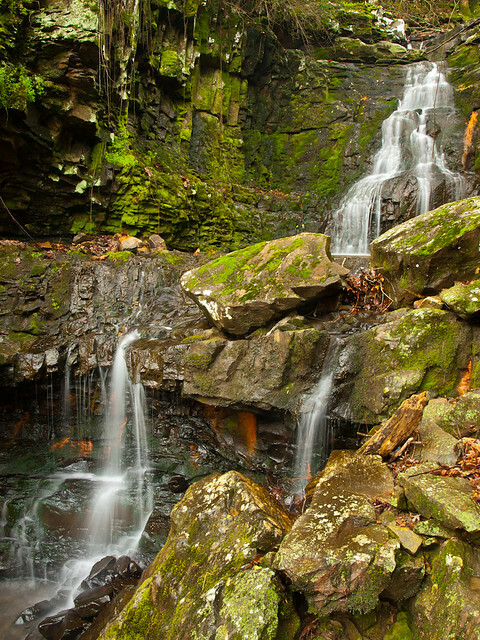 The creek has carved through the rocks around the falls, which are covered with a carpet of moss. After slipping and sliding down the hill, and dodging a maze of fallen tree limbs, I was soon back to the car and made the short drive back home. It may not be the most scenic waterfall in the state, but it gets bonus points for only being a 15 minute drive from away. 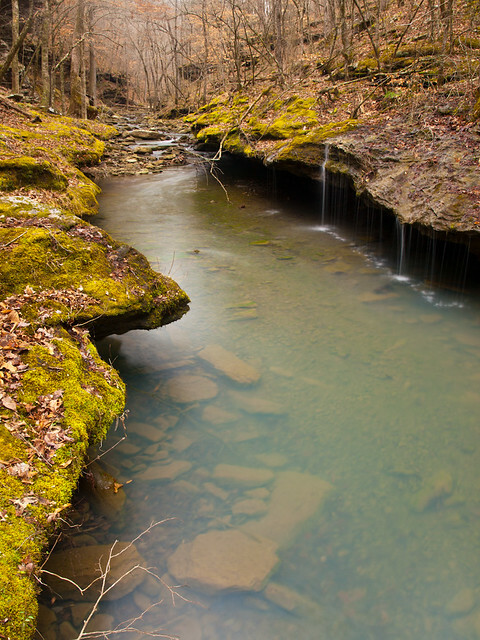 On Saturday morning, Matt and I headed out to do some hiking in the Ozark National Forest. 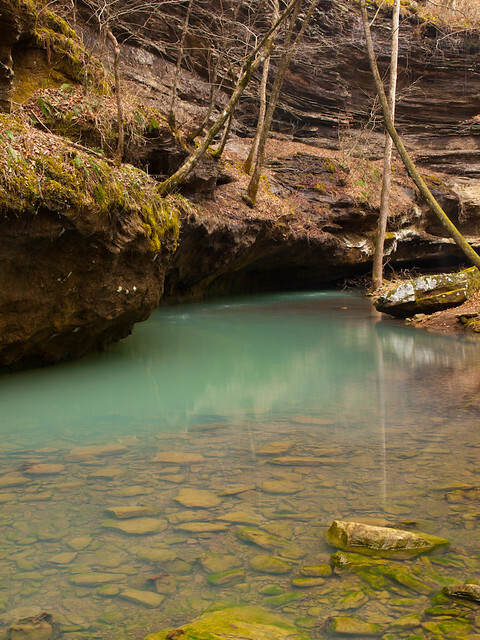 The destination that day was the ominously named Graves Canyon, which flows into Big Piney Creek north of Russellville. Although we saw no graves there, the hike in and out of the canyon did a real killing on my legs. The hike to the falls is listed as a difficult two mile bushwhack. But we cut down on the hike some, thanks to Matt's Xterra. Part of the hike follows an old jeep road that only 4-wheel drive vehicles can go on, but we had no trouble making it all the way down the road to the spot where Graves Creek meets the Big Piney. Along the way, we stopped at this little waterfall that was just off of the side of the road. It isn't the most impressive waterfall, but I liked the large cedar tree and the exposed roots sitting above the falls. From there we drove back up the hill and started the hike. 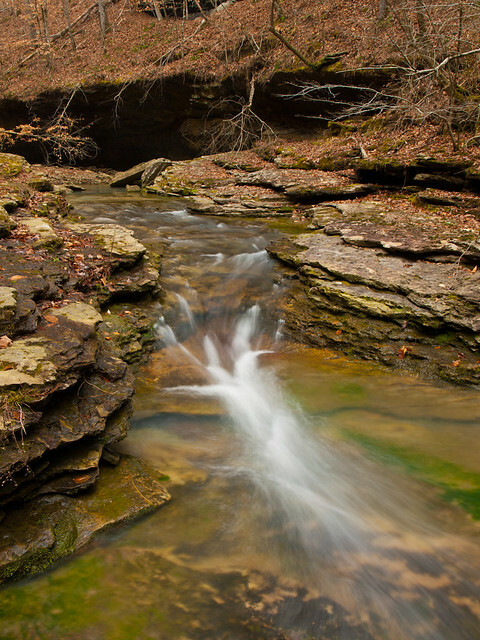 Like most places in the Ozarks, the neat stuff on Graves Creek can only be reached by hiking down a steep hill. Luckily the creek is extremely scenic, and worth the effort. Soon we were back at the creek, and ready to see some waterfalls. But of course, only after shooing away a copperhead snake that was perched right in the way where we were going. Just downstream on the creek is the next waterfall, Forever Falls. The name isn't entirely accurate, since the falls don't really fall on forever. They're actually only 47 feet tall. 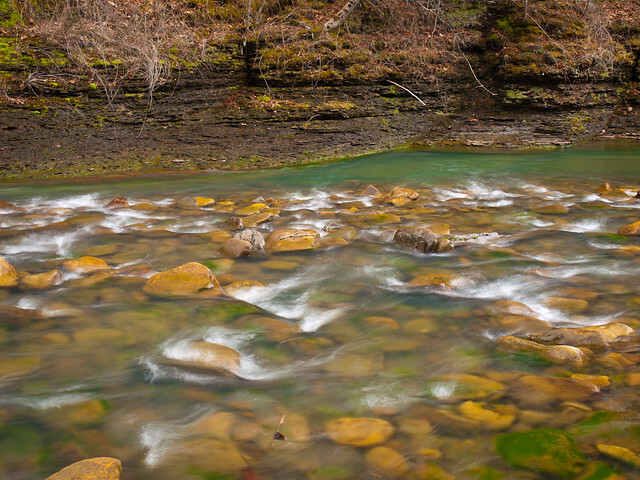 But they do drop from a bluff into an emerald pool in the creek. 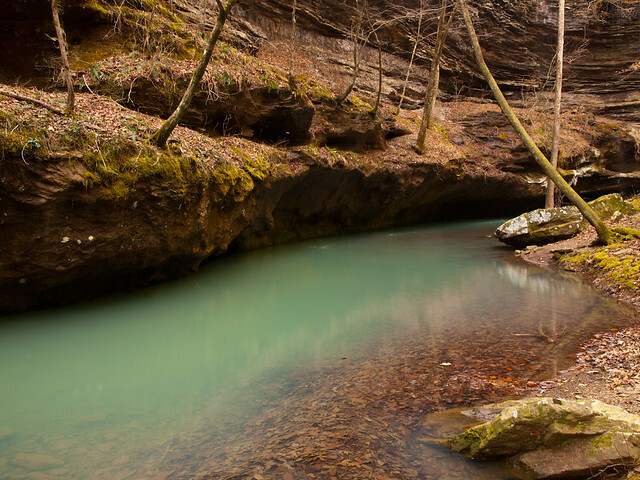 The water in the Ozarks always has a bluish-green tint to it (thanks to dissolved particles of limestone in the water), but the creek here was a paler green. 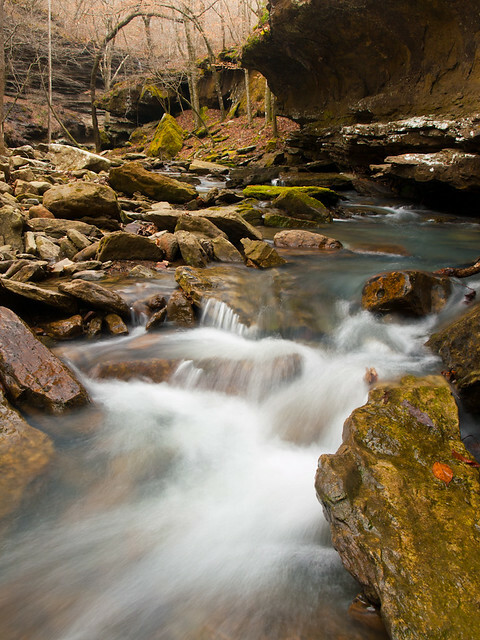 There are several waterfalls that flow down the hillside into Graves Creek. 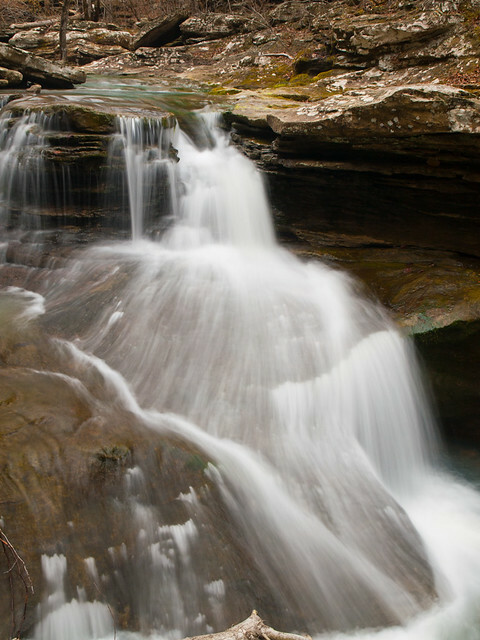 This one is one of two waterfalls called Graves Canyon Falls (the other is just upstream). This shot only shows the bottom portion of the falls, but it's actually about 35 feet tall. After that, it was time to make the long hike up the hill to the car. It was steep, but I managed it without too much complaining to Matt. After getting back to the car, we headed out and explored some more of the dirt roads nearby. Along the nearby Indian Creek, we found this neat little spot and took a few pictures.